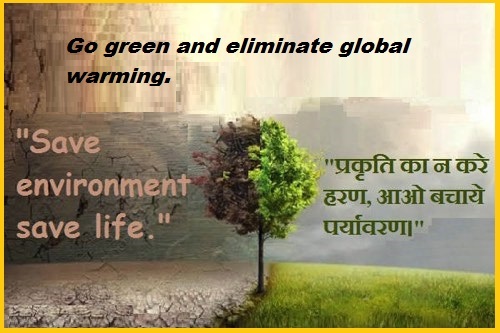 SLOGANS ON ENVIRONMENT:- Environment safety and make it green is the urgent need of today. We need to maintain its naturality more than the speed we have destroyed it. Misbalancing the natural cycle of the environment is leading towards the destruction of life from this planet. Therefore, it is very necessary to understand the importance of a healthy environment and maintain it forever to continue life. Slogans on the environment are the best way to encourage people towards saving the environment. 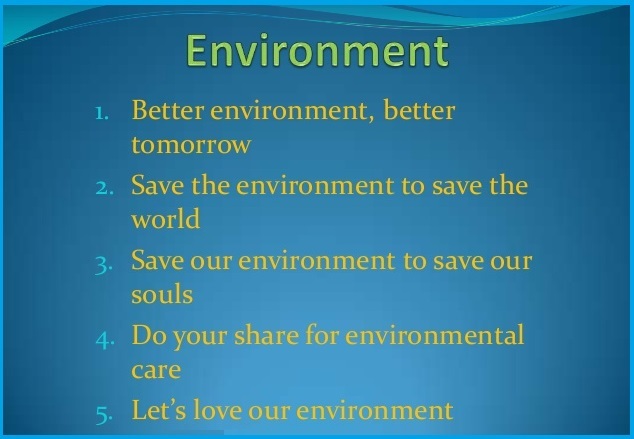 Save environment slogans may easily motivate others about environmental safety and health. 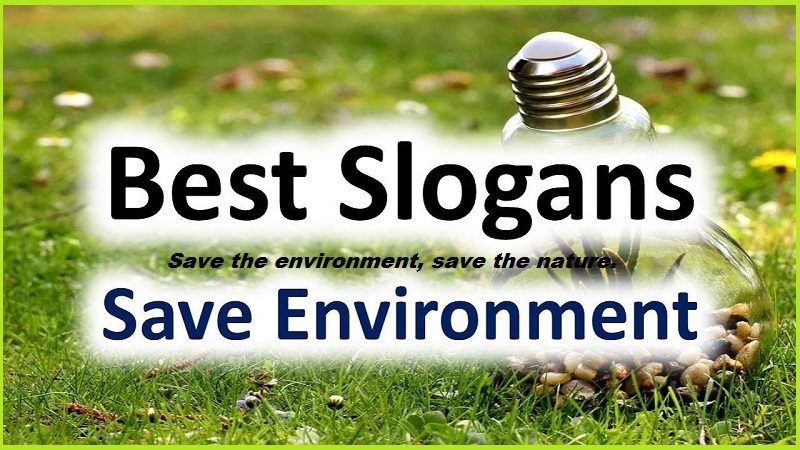 We have provided below some effective and motivational slogans on the environment which can be used at any related occasion, event celebration, etc to encourage people. Following environment slogans can be used for environmental awareness among people to protect and keep our environment clean and serene. Let’s go green as it makes the environment clean. Save the environment, save life. Respect nature and save the environment. Save nature to save the teenager. Save nature to save the future. Go green and eliminate global warming. God has blessed us with a green environment! If we lose blessings, we lose a healthy life. One who does not love nature, cannot love anything in life. The saving environment will only save the future generations. The natural environment is everything for a healthy life; we should maintain it. The environment is green but we need to make it clean! To have a protective screen, let our environment be green and clean. Love Nature!! If you don’t, you haven’t humanity. 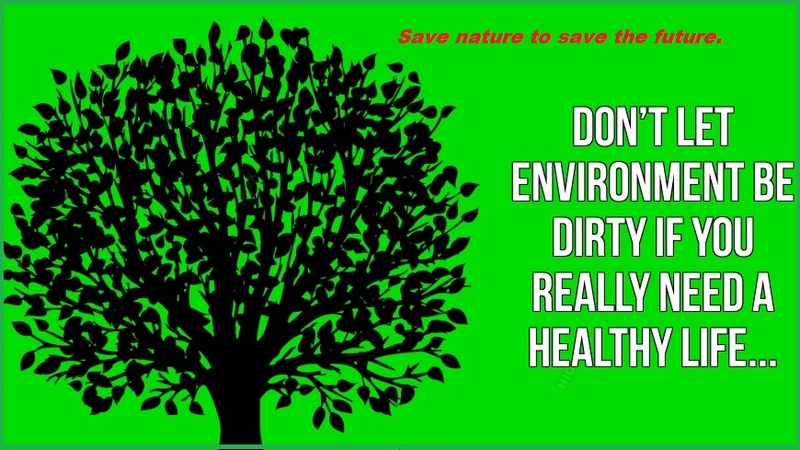 Don’t let the environment be dirty if you really need a healthy life! Save the environment to save future Generations. Earth is the only planet having a favorable environment for life! So, save it. Save the environment, save the earth!! Save the environment from global warming. It’s time to work together on the theme of “safe environment”. Let’s work together to save the environment. It’s time to aware people about the benefits of a clean and green environment. Make a safer environment for better tomorrow. 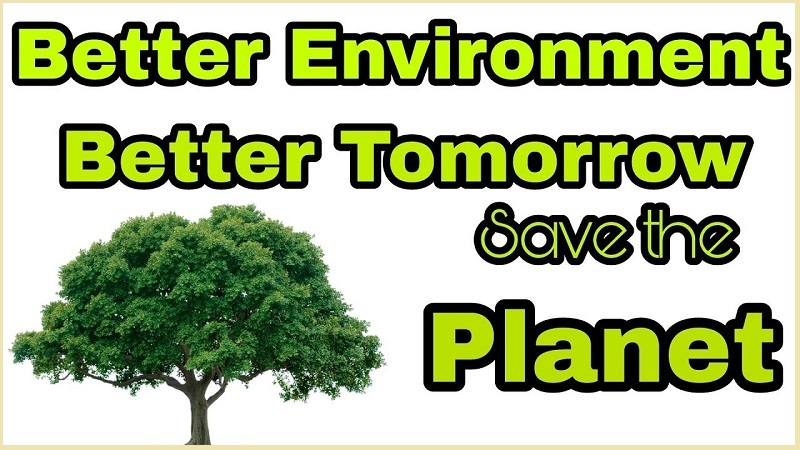 Let’s save the environment as a safer environment bring a healthier life. We cannot generate a new environment but we can save it. Greenery is good for eyesight; so, maintain it in the surrounding. Don’t be so mean, just be green!! we should not waste it for our greed. Saving the environment, we save the earth and life. We need to be a team with one goal of a neat and clean environment. It’s time to make a pollution free environment. We really need a pollution free environment! Just do it. Keep the environment safe and pollution free. Invest some time for environmental care and safety. Pollution is injurious to the environment. Tree plantation is the best option to gain green environment. Don’t let our environment be polluted!! If we pollute the environment, we destroy our life. Stop pollution to prevent future environmental disaster.